At a time when walls and fences are going up across Europe in response to the migrant crisis, there is hope a long-standing barrier in one part of the continent could finally come down in 2016. After decades of division in Cyprus, there is genuine belief a political solution will bring together Turkish Cypriots in the north and Greek Cypriots in the south. Since 1974, when a brief Athens-inspired coup was followed by a Turkish military invasion, the island has been cut in two, with the northern third controlled by Turkish Cypriots and the southern two-thirds by Greek Cypriots. The catalyst for the negotiations was the election last April of the Turkish Cypriot President, Mustafa Akinci, who campaigned on a promise to broker a peace deal with the south. Negotiations between Mr Akinci and Nicos Anastasiades, the Greek Cypriot President of the island, began last May. It is fitting that the bulk of their talks are being held at Nicosia airport, a site that symbolises the stalemate in Cyprus. Abandoned during the conflict of 1974, it is now sandwiched in the UN buffer zone, frozen in time. The lonely shell of a Cyprus Airways passenger jet lies on the tarmac. The terminal, which opened in 1968, is now home only to nesting pigeons and the smell of damp. Advertising posters from 1974 remain fixed to walls. You could forgive the pessimism of Cypriots who shrug their shoulders when the prospect of a peace deal is raised. They have seen this before. In 2004, the UN's plan to make Cyprus a federation of two states was emphatically rejected by the public in a referendum. Twelve years later, there is a sense the political atmosphere has changed. A short stroll from the airport is the office of Aleem Siddique, the spokesman for the UN on the island. "One of the key reasons why people are a lot more optimistic this time around is the trust between the two leaders," he tells me. The two presidents share much in common. They are a similar age, and both were born in the southern city of Limassol. In December, they delivered a joint TV address to wish residents a happy holiday and spoke of their hopes for a deal in 2016. In the centre of Nicosia, it's impossible to escape the reminders of the conflict. The UN buffer zone snakes through Europe's last divided capital. It is lined with derelict, crumbling buildings and endless spirals of barbed wire resting on oil drums. There is one place in the buffer zone where the atmosphere is much more welcoming. The Home for Cooperation, a community centre open to everybody on the island, hosts classes where people can learn Greek, Turkish and English. 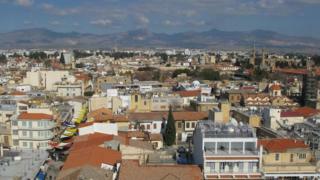 Language remains a big obstacle to integration in Cyprus. Yaprak Aydin, who lives in the Turkish-controlled north, says the centre is also about people coming together and developing empathy for those not from their own community. She smiles as she recalls a story of a Greek Cypriot lady who got in touch with the centre to tell them she had met her best friend in their cafe. The friend was Turkish Cypriot. "Never underestimate the power of a cup of coffee, especially in Cyprus," Ms Aydin tells me. Despite the sense of hope, there remain big obstacles to overcome. Governance: Broad agreement the new state should be based on a federal model; but how loose should that federation be? Territory: How much land should be administered by each community? During the conflict, tens of thousands of people were displaced from their homes. The delicate question remains what happens if the island unites. Is the property returned or will the owners compensated? And from where would the money come? Security is a further complication. For many Greek Cypriots, the departure of Turkish troops from the island is non-negotiable. For some Turkish Cypriots though, the Turkish military presence provides reassurance. However, following the financial crisis on the island in 2013, there was recognition a solution could reap economic dividends, with trade routes opened up to Turkey. For Mr Siddique, though, Cypriots should consider not only the economic benefits, but the international example that would be set in the region. "The symbolism of a largely Muslim Turkish Cypriot community and a largely Christian Greek Cypriot community coming together would send such a strong signal across the world," he says.